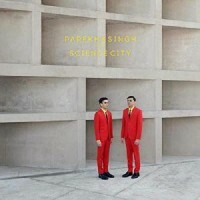 Science City is the second LP from dream pop duo Parekh & Singh. If their debut Ocean conjured a lush landscape populated by magical creatures, Science City sees our sharpsuited star-gazers materialising in another dimension - a retro-future world of doctors and scientists, quantum mechanics and plans to unlock the secrets of the “Universosphere”. Parekh’s divine vocals once again backed by vintage synths and Singh’s expertly effervescent percussion. Opener Sunbeam depicts an ‘AI being’ blinking in the sun whilst contemplating its own obsolescence. Down at the Sky is an Escher-like search for truth and Hello is described curiously as “creamy music for advanced nighttime driving on deserted streets”. The ennuidrenched Summer Skin opens a hazy portal to the bucolic, where we find our singer alone with an acoustic guitar, pondering the “momentariness of life”. Be Something’s squelchy synths and xylophone runs channel a rainy day Steely Dan. While Evening Sun soars over circuit board landscapes, with 8-bit laser gun FX pulsing by, Monkey depicts a video game set in a luminous forest biosphere. Following Surgeon’s dissection of the dark heart of the infosphere, the prog-pop splendour of 100 Shadows journeys below “our troubled surface world” to a secret kingdom of synthesisers. For all the talk of “particle physics” and “aerodynamics”, it’s love that sustains life in the dreamlike Fwd Slash. The limpid beauty of soul-pop gem Crystalline brings Science City to a suitably sublime conclusion.